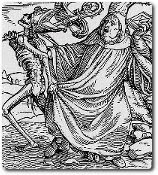 Writers have been writing about death for centuries. When it comes down to the event, in whatever form, we might as well be three-year-olds trying to write about quantum physics. Even if we are Shakespeare. So I won't write about it. Maybe I'll feel deluded enough about my own abilities to give it a shot later; maybe later, I will join the halls of the wildly conceited. Today, though, I'm feeling pretty realistic.